Access to essential medicines is a well-established component of the human right to health, but it is a right that remains elusive for millions of people across the globe. The United Nations estimates that 10 million people each year die because they cannot afford medicines. Even in the United States one out of every five Americans does not fill a prescription each year because they cannot afford it. Protected by monopoly patents, medicines are routinely priced at levels hundreds of times their manufacturing costs, and far exceeding research investments. The corporations that sell the medicines enjoy record-breaking profits yet still routinely raise prices by double-digit margins each year. There are a few promising steps toward change, including South Africa’s progressive new policy that prioritizes patient access over intellectual property monopolies, Colombia’s and Malaysia’s bold steps toward making affordable hepatitis C medicines available in their countries, and the US state of Nevada’s union-led campaign that produced a law requiring transparency in insulin pricing. Proposals for reform are pending at the federal and state levels in the United States, and there are multiple international initiatives as well. Yet deadly gaps remain. Only about one of every 20 cancer patients in Africa receives chemotherapy. For childhood cancers, many of which have high cure rates if treated, 80% of African children die without adequate care. For most of the world’s population, access to the newer biologics medicines is out of the question. In all but the wealthiest handful of nations, less than half the oncology drugs introduced in recent years are routinely available. Patients in richer countries are not immune from the struggle to access medicines. The median price of patent-protected cancer drugs in the United States is now over $10,000 per month. Insulin prices that have increased over 1,000% since the late 1990s are causing half of the world’s people with type 1 diabetes to have uncertain access to the medicine that they need to stay alive. The United States is also witnessing widespread rationing and even deaths among persons dependent on insulin. Why is there such a disconnect between popular frustration and real change? An obvious barrier to change is the immense political power of the pharmaceutical industry, which directs a significant share of its windfall revenue into political campaign contributions and aggressive lobbying. But another, less obvious, reason is that access to medicines advocacy in recent years has mostly been led by policy wonks, professional activists, and healthcare professionals. The patients for whom drug pricing is a matter of life or death have not been front-and-center. In part, this is understandable. Many patients are too sick or too preoccupied with confronting their own personal crises to devote themselves to activism. But what about the many large and influential patient groups? Sadly, most stay on the sidelines of the drug pricing debate. In April, Kaiser Health News showed why in its disturbing report, “Patient Advocacy Groups Take in Millions from Drugmakers-Is There a Payback?” The article tallied the money paid by pharma companies to patient groups, and observed how most of those groups then fail to oppose their donors’ medicine price increases. In fact, the groups often actively support the pharma industry’s opposition to price regulation. “The ‘patient’ voice is speaking with a pharma accent,” says a researcher who reported his analysis of the donations process in the New England Journal of Medicine. But that may be changing. T1International, a type 1 diabetes patient advocacy group that refuses pharma company donations, engages in both global advocacy education and spirited direct activism. That activism has included multiple demonstrations in front of the headquarters of insulin manufacturer Eli Lilly. 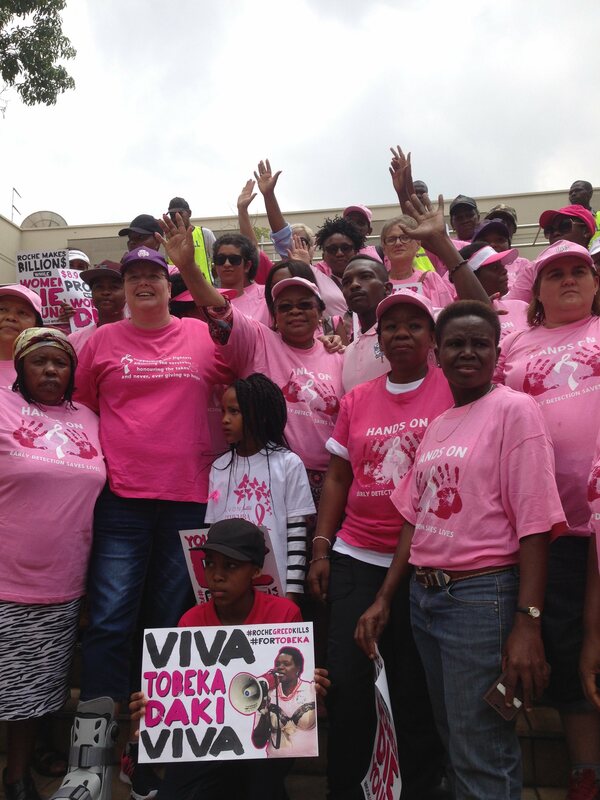 Treatment Action Campaign of South Africa features patients in its push to lower prices for the breast cancer medicine trastuzumab. In India, the Cancer Patient Aid Association led a multi-year struggle that successfully fought off Novartis’ effort to extend its monopoly patent on the leukemia treatment imatinib mesylate. There are other examples. Thai activists helped convince their government to allow generic manufacturing of four patented cancer medicines. The patient-directed Union for Affordable Cancer Treatment is leading the fight for US generic manufacturing of pacilataxel, and has successfully proposed a cancer drug pricing study by WHO. The Just Treatment campaign features patient voices in its successful efforts to push down drug prices in the UK. Patients for Affordable Drugs is aggressively pushing for medicines reforms via the US media and lawmakers. Chinese leukemia patient Lu Yong violated national law by purchasing generic medicines from India and distributing them to fellow patients. When Yong faced charges for his actions, hundreds of those Chinese leukemia patients petitioned a court on his behalf. Their advocacy seemed to have an impact: soon after the patients’ petition was filed, the Chinese patent office invalidated the national patent on the medicines Yong was importing. And the protests of cancer patients have been credited with helping inspire resistance to the Trans-Pacific Partnership among the grassroots in many party countries. These advocates point to the significant government funding that undergirds the earliest and riskiest stage of drug research—every single one of the 210 new drugs approved by the US Food and Drug Administration from 2010 to 2016 trace their origins back to taxpayer-funded research. Advocates show how the pharmaceutical industry’s profits and marketing costs exceed its investments in developing new medicines. And they lift up the generations of cross-national precedent for treating medicines as public goods and therefore off-limits to profit-seeking monopolies. In the struggle to realize health as a human right, it is impossible to overstate the importance of patient advocacy. The history of successful social movements shows us that world-changing human rights campaigns like the US civil rights movement, the resistance to colonialism, and the anti-apartheid struggle were all led by people directly impacted by these injustices. The struggle for affordable medicines needs patients in the lead, too. Those kinds of protests mobilized patients and ratcheted up the public pressure on pharma companies and the US government that had been protecting them. It took years of persistence, but eventually, both the government and the companies cracked. The price of antiretroviral drugs plummeted over 90% nearly overnight, and this saved millions of lives. That was the legacy that inspired the brave, powerful cancer patient activists Tobeka Daki of South Africa and Zahara Heckscher of the United States. I had the privilege of spending time with them, and hearing their stories. Those stories, and that of the broader fight patients like them are waging every day, can be read here.